Nicknamed the “Sunflower State,” Kansas is the geographic center of the United States of America and is also known as the Jayhawk State, Midway State, and Wheat State. Kansas is a blanket of plains and prairie lands which have the largest wheat production in the state. Kansas welcomed its early inhabitants back in 1822 when the Santa Fe Trail led many hundreds of settlers to it. As the population increased, Kansas was declared as a state in 1861. The major agricultural economies of Kansas are soybeans, cattle, wheat, and corn. Well, just in case you’ll like to know here are the reasons for the nicknames. Sunflower State: As a reminder of the wild sunflowers that are found in abundance across the state. The sunflower is the official state flower and floral emblem of Kansas. Wheat State: The leading provider of wheat for the whole country and was top ranked in wheat production and milling. Midway, Central State: As mentioned above, because it is the geographic center of the nation. Kansas is perfect for those who love a taste of history. In that case, visit Topeka to catch a glimpse at the many historical sites, or Wichita the capital which is constructed upon the roots of aviation and learning. Lawrence and Manhattan are the college towns of the state and Olathe has scenic lakes. Kansas truly has something for everyone. Do you like Kansas? Share your passion! Moving in winter will be hard due to the large volume of snowfall, so plan your trip carefully. If you have no other option, make sure you take all the necessary precautions to ensure a smooth move-in, like a fully charged cell, toolbox, first-aid kit, provisions, etc. Always be ahead of time, especially if you’re driving a moving truck. Kansas is home to numerous festivals, so check your dates to avoid congestion and getting lost in the crowds. Change your address using USPS online change of address form. The atmosphere of Kansas can be divided into three: humid continental, semi-arid steppe, and humid subtropical. About two-thirds of Kansas’ eastern parts have a humid continental climate with temperatures ranging from cool to cold winters and hot, humid summers. Summer and spring have the most precipitation. The western part of Kansas has a semiarid climate with hot, dry summers. Winters vary from being scorching to icy. The southern regions display a humid subtropical climate with more precipitation compared to other places. Sometimes it is so hot in places like Wichita that the heat index rises to a life-threatening level which makes Kansas the 9th sunniest state. Kansas is susceptible to harsh weather conditions because it is located in a climate boundary which is prone to strong and severe thunderstorms. Kansas springs often bring the threat of tornadoes. The state averages about 50 tornadoes per year, most of which cause property damage rather than death or injuries. Cities of second class: Population between 2,000 and 5,000. The primary and secondary level education in Kansas is governed by the Kansas State Board of Education. The Kansas State Board of Education supervises 37 public institutions and also provides permission for various other private institutions to function. Higher Education: the University of Kansas, Friends University, and Wichita State University. In addition to this, Kansas also has a community college system. The best part of moving to Kansas is the abundance of meat and bread. You can easily have a burger fiesta every night! Oh and also, obesity comes free with it, so watch it. 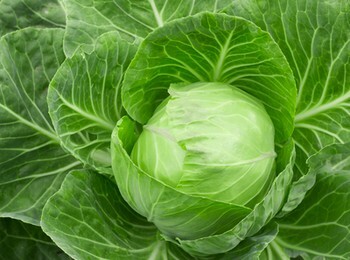 If you like locally grown fresh food, check out these farmer markets in Kansas. 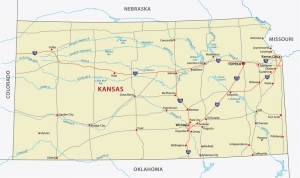 The road to Kansas comprises of two interstate highways; with one beltway, two spur routes and three bypasses. 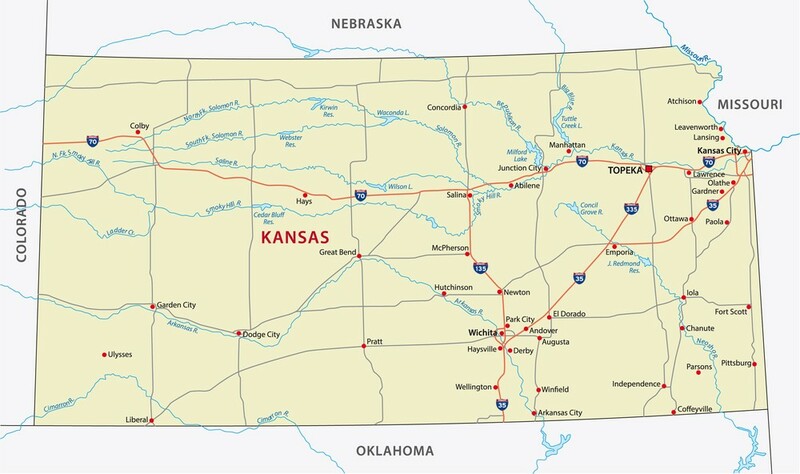 The third largest highway system is found in Kansas, after Texas and California. Kansas also has a traveler information service which was launched in January 2004 where people can access information about road conditions, closures, detours and weather conditions of the highway system. The only major commercial airport is a class C airport which is located in Wichita, the Dwight D. Eisenhower Airport. The second largest commercial airport is Manhattan Regional Airport. The other means of travel is by the Kansas City International Airport, Missouri and Denver International Airport. People in the southeastern region use The Tulsa International Airport, Oklahoma or Joplin Regional Airport, Missouri. The median household earns $54,865 in Kansas. The cost of living in Kansas is 21% lower than the US average, and this means that almost everyone can have a fit lifestyle. This low cost of living is mainly because Kansas produces its food and consumer products which mean that the most basic needs are easily available and therefore cost less. For married couples, the rates are the same, but the income brackets are doubled. Property taxes in Kansas are ranked 14th highest in the United States. But, the population density is comparatively low, and this results in affordable housing and insurance costs. Kansas state tax revenues are used for city and county governments for fire protection, roads, parks, and schools. Kansas property taxes are usually billed in February and sent out by March 1st annually. In case if you see any discrepancies, you can report to the local county office within 30 days of receiving the notice. The highest average real estate payment belongs to the Johnson County. Originally, around 10.5% of the people were of Hispanic or Latino origin. In 2004, 5.5% of the state population were foreign born, and their ancestries were a mixture of European origins like 33.75% German, 14.4% Irish, 14.1% English, 7.5% American and the rest around 11% which include French, Swedish, Italian, Dutch, Scottish and Polish. Mexicans are vastly found in some counties, and they make up more than 50% of the population. Spanish is the second most-spoken language in Kansas after English. The Christians are 76% of the Kansas population. Kansas often hosts the Big 12 Basketball tournaments. The Arrowhead Stadium is often the venue for inter-college football games. During the last week of October, the game between Northwest Missouri State University and Pittsburg State University are hosted here. Additionally, the Kansas Speedway conducts many motorsports events, one of NASCAR’s national series and IndyCar series. NHRA also holds drag racing at the Heartland Park Topeka. Kansas City is the fine domestic place of the Mid-America Intercollegiate Athletics Association. What else could be better than the good old Home on the range? Plenty of ghost towns to poke your curious noses in have a good scare. Tornadoes and cyclones happen frequently. Hold on to your hats and umbrellas! You’ll be charged an excise tax between 6.3 and 7.65% for any untaxed vehicle you purchase or bring to the state. Apply for a KS driver’s license to register to vote online. Register your vehicle at the local county clerk’s office within 90 days of moving. Perform an emissions test as well. The cost for a passenger vehicle is $39, $10 for a title and $4.5 to record any lien. Check trash and recycling companies to take care of your waste management systems.